Freebies, Hot off the PResses!, iSUPPORT, SheGotAccess, SheGotTracks, Turn off Ur Radio, We don't write rhymes we write checks! G.O.O.D. 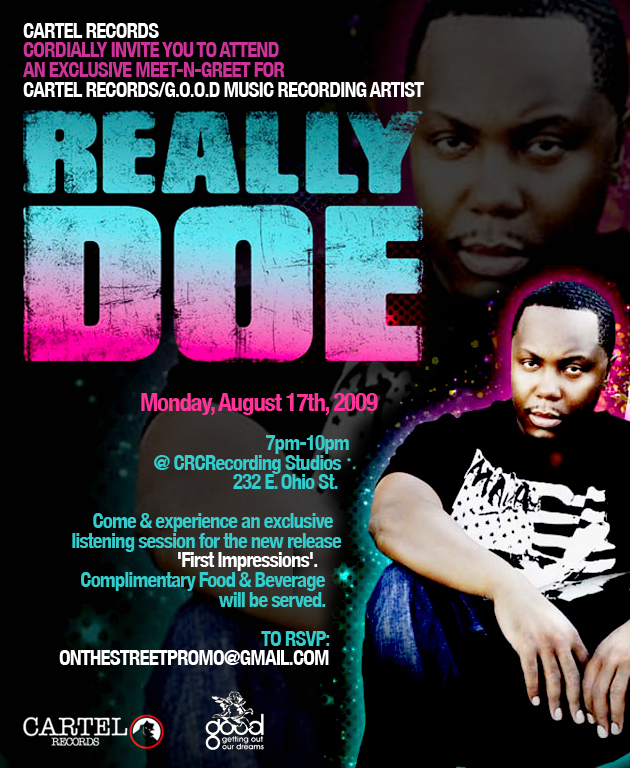 Music, alongside Cartel Records, will host the official album release party for artist Really Doe this Monday, August 17th from 7p – 10p at CRCRecording Studio (232 E. Ohio St.) in Chicago, IL. If you haven’t heard the latest from Really Doe, I have included his NEWEST single “Mesmerized” which is also available for purchase on iTunes. “First Impressions” is the first album from the artist. He has preveiously been featured on labelmate Kayne West’s “We Major” featuring NAS on the album Late Registration and Consequence’s “Disperse” featuring GLC on the album Don’t Quit Your Day Job. For more information about Really Doe or the album release party, please visit www.really-doe.com or www.myspace.com/reallydoe. And as always, tell them I sent you!